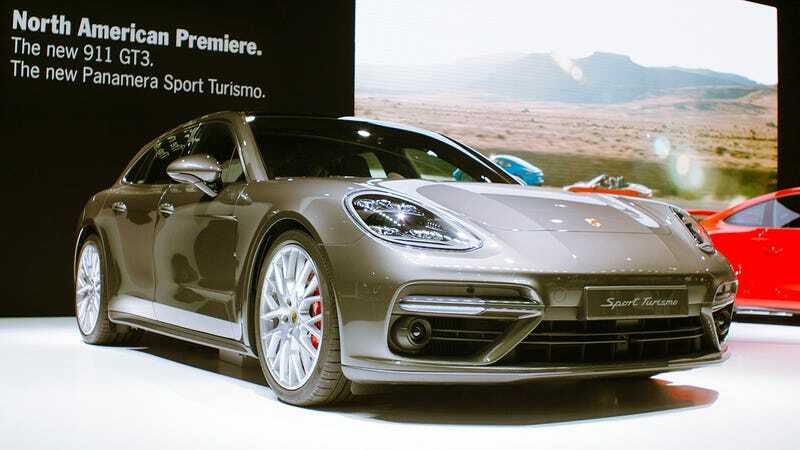 Reach out with your eye-hands and see-touch the new Porsche Panamera wagon (officially the 2018 Porsche Panamera Sport Turismo) that has finally landed in the United States. It’s here, y’all, and it looks amazing. How many years has it been since we’ve been waiting for this car? The concept version came out in 2012. It’s only really been five years, but it somehow feels even longer. We all knew that a longroof version would be better looking and more practical. Now it’s finally here, though in person it doesn’t look exactly as you’d think it would. The lines are a bit chunkier than you’d expect. The final rear pillar is immensely thick, both in how much space it takes up on the outside of the car, and on the inside. It’s cavernous in the back seats of this wagon, and I don’t mean that it’s huge. It’s like sitting in a tiny leather-lined car hole. Dark. Cocooned. Also the rear glass is very sloped, not upright like a practicality-oriented old Volvo or something. It’s more like this car has an extra big trunk than anything else. But it all looks like it was meant to be. The lines are so natural. You only wonder why it took so long for Porsche to build this thing.